Book review: "Song of the Simple Truth"
This review first appeared in the American Reporter in 1997. If you've never heard of the late Julia de Burgos, you're hardly alone. Largely forgotten by contemporary poetry fans, Burgos wasn't much better known before her death in 1953. But according to the introductory notes to a new collection of all Burgos' known poetry by translator and compiler Jack Agueros, Burgos was one of Puerto Rico's most gifted poets  a writer who championed the Puerto Rican independence movement and feminism in equal measure. Why do they try to tie it to immovable courses? Give Agueros credit  unlike many translators, he asks you to judge his work: Each poem is presented both in the original Spanish and Agueros' English translation. 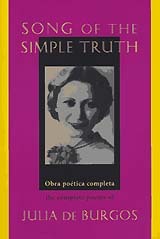 If you're at all conversant in Spanish, it's a revelation to have her work in both languages: Poetry is the most difficult of all literary forms to translate, yet if your understanding of Spanish is limited, having Agueros' help you through some of the idioms that may be dated or specific to Puerto Rico is definitely a help. Pintando las auroras con mi unico color de soledad. Painting the daybreaks with only my color of solitude. The meter is, by necessity, different in the two languages, the rhythm and accents unique  which is why Agueros' and the publishers' decision to publish Burgos' work in both languages is so worthy of recognition. There are 203 poems here, all that Agueros found of her poetry, collected from her two books of poetry (which contained only 53 poems total! ), and from previously uncollected verse in magazines. Agueros writes in his lengthy introduction (also in Spanish and English) that there may be other poems in obscure journals or even unpublished manuscripts not yet discovered. What is here, though, is wonderful and moving and shows that Burgos deserves a better fate than being forgotten.